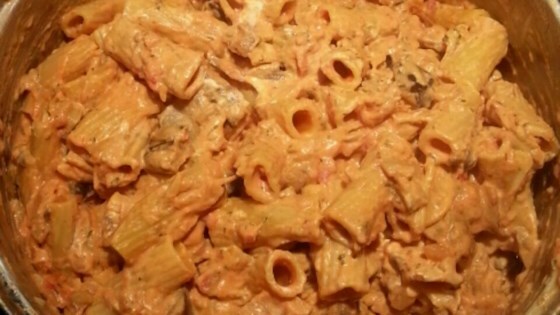 "Delicious and hearty rigatoni, eggplant, mushrooms and goat cheese, all mixed together and served hot." Heat olive oil in a large saucepan over medium low heat. Saute onion and garlic until soft and translucent, about 5 minutes. Increase heat to medium high. Stir in mushrooms, and cook until lightly browned, about 5 minutes. Stir in the eggplant, and cook 5 minutes. Stir in the tomatoes, chicken broth and olives. Season with thyme, salt and red pepper flakes. Bring to a boil. Reduce heat, cover, and simmer 30 minutes, or until eggplant is tender. Toss with pasta and goat cheese. Fresh arugula and cherry tomatoes in a creamy, garlicky pasta sauce. Fabulous! Minor alterations: Served this with whole wheat pasta, heavier on the garlic and red pepper, used vegetable stock and leftover roasted eggplant. I also left out the olives. Excellent Recipe! My family enjoyed it a lot. I added italian seasoning, basil leaves and oregano for more flavor. It tasted very good. I will surely make it again. This was a tasty recipe, I used feta instead of the goats cheese and added some diced zucchini with the eggplant to increase the vegetable intake! Do NOT substitiute the goat cheese, it makes the dish amazing. My family loved this meal.